It’s been a little less than a week since my IA Summit presentation. To my great surprise, it went really well. I mean really well. In the next day or so I will be posting a summary of my experiences preparing and discussing my topic, which was, in a word, style. These readings are in roughly the same pedagogical sequence that the concepts appeared in my presentation. Note that not all of these were actually cited in the talk, but I did have all of them either at hand or in mind as I wrote. www.patternlanguage.com is Christopher Alexander’s web site. All 253 entries from A Pattern Language are included in this site, and they are hyperlinked to each other. Many have been updated, too. This is an amazing resource and a fascinating site overall. Well worth the $5/month access fee. And, of course, none of this would have been possible without Wikipedia and Google Images. Hi Chris, yours was one of the best presentations I saw at the Summit this year. Thanks for posting these materials! BTW, I ordered “The Architecture of Happiness” based on your recommendation, and am awaiting its arrival. Chris — Excellent talk, I enjoyed it thoroughly. 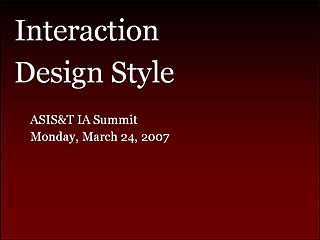 This is amazing – you’re pretty much making me feel like crap for not being at IA Summit 2007. Particularly loved the references to the fashion, architecture and literature worlds – great job! 238 slides? You’re a courageous man, Chris. ;-) Did you pick and choose your slides as you went along? I had fun attending your talk too, refreshing to have someone talk about the visual aspects of UX. Very informative. I am glad I was paying close attention to this months InfoDesign.org newsletter. I imagine you’ve read Richard Dawkins -The Selfish Gene? The notion of “Memes” came to mind as I paged through your images on the evolution of stylistic traits. I wasn’t there and stumbled on your presentation accidentally. As a presentational designer and author of Presentational Skills for the Next Generation I have one word for what you presented, WOW! Looks like I really missed a fabulous presentation. Are We Designing Interactions or Designing Software?